4/4 Knilling Bucharest Violin with perfection pegs, PERFECT condition, excellent warm tone! Made in Romania in 2005; only one owner. 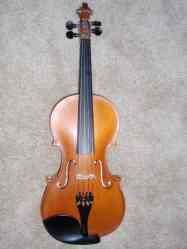 Professionally valued, including high quality case and two bows, at $750. Will sell for $600 or best offer. Please contact if you have any questions.